Today I read a somewhat lengthy post from a Mom of two human children that pissed me off a bit. Long story short, she got a hefty tax return back and bragged about it. People replied. A lot of the people who replied don't have human kids. Most are pet parents. Some dedicate their life to animal rescue. They work a full time job in addition to a part time job. A handful work two full time jobs. The majority of the replies to her post were probably not something she had anticipated. This was obvious in her most recent post. "I'm so sick and tired of people insulting me because of how much tax return money I get back each year. If any of you knew the struggles of having two kids, you'd understand. I spend a ton of money a year on clothes, food, school supplies and other stuff for my kids. They don't go without. I work a full time job and my day doesn't end when I get out of work. I have to cook dinner, help my kids with homework, clean up puke when they're sick, deal with school issues and, at the end of the day, I have no time for myself. This includes weekends when the kids are home from school. My husband and I don't go on vacations and we can't afford the luxuries like a new car or new appliances. We pay friends and family members to provide childcare for our kids during the summer months when they're on vacation. The money we get back from our tax returns is small in comparison to what we dish out for our kids. For those of you who replied, who don't have kids, you have no idea what those expenses are. I don't appreciate you insulting me because of my excitement this time of year when a small portion of that money is returned. You have no idea what it's like or how often we live paycheck to paycheck. I'm sick and tired of the insults from people who are not parents. You have it easy. You don't have to worry about the extra expenses. Consider yourselves lucky." It took me a while to process that one. Not only do I despise any and all attitudes of entitlement, what jabs my nerves are the parents of human kids who think they have it the roughest. The ones who feel that unless you're the Mom of human kids, you have no idea what it's like to be a Mom. Or the expenses involved. This time of year, these posts are all too familiar. I didn't reply to the above post. However, that doesn't mean I'm not bursting at the seams with a general reply. Lisa and I are Moms. Dog Moms. 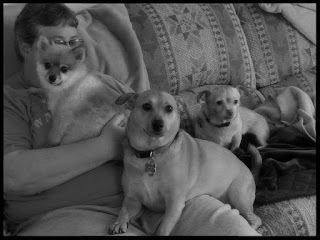 We have 3 rescue fur-kids. One was adopted out twice and returned. He was deemed "un-adoptable" at that point and therefore his medical issues were ignored. Why fork out money for medical care at that point, right? When we adopted him, he was in poor shape. Our second kid is from a cruelty case. We fostered her for almost a year and then, when the court case was over, we adopted her. Our third is special needs. He was on death's door when rescued and two days after being rescued, had major surgery to remove one of his hind legs. His remaining hind leg does not have full mobility. The medical expenses, over the past few years, have been extensive. There's also yearly medical expenses including checkups, flea and tick preventive, vaccinations, annual rabies shots, heartworm preventive and other miscellaneous costs. We also fork out a decent portion of our income for food. We make all of the kid's meals and treats fresh. Homemade. They're fed lean, baked meats including chicken, beef and occasionally seafood. In addition, with their protein, we include whole grains, steamed fresh or frozen vegetables, fresh fruit, Greek yogurt, mashed organic pumpkin and homemade treats. Other expenses include apparel to protect them from the elements, toys, blankets, anything that makes their life easier and more comfortable. No expense is spared. On top of that, we run Bodacious Biscuit Love which we add into our monthly expenses. After almost three years, we've accepted that we'll indefinitely be running out of pocket. That's okay with us. We love what we do. Lisa works full time, away from home. I work at home. Being a work-at-home-dog-Mom is the only reason why we're able to have 3 kids...one being a special needs. Sure, I could be working away from home or accept full-time position involving travel or 100+ hours a week, making a lot more money, however, we have opted to do what we do. Lisa's income is what mainly provides for our household and family. She gets up every morning at 3:45 and doesn't get home until mid afternoon. Not once has she ever complained. She's a hard worker and is in the process of moving up the ladder within her company. I admire her dedication and hard work. She'll do whatever it takes to provide for our family and to ensure none of us goes without. Like with you, we make sacrifices. We don't go on vacations. In fact, the last overnight vacation we went on was a couple of weeks before we adopted our first kid, Coco. That was 4 years ago. Vacations and weekend getaways are a thing of the past. Our sofa is almost 25 years old. It's a hand-me-down from my mother. My parents purchased this sofa back in 1992. It's falling apart. We need a new one, however, for what we need as a replacement, it would cost close to, if not over, $1,000. That's not something we can afford right now. The only TV we have in our home is ancient. It's not a flat screen. In fact, we're able to put decor on top of the TV. If you can determine how old it is from that bit of info, kudos to you. Like our sofa, we could use a new one. We budget our money. There's enough left over at the end of the week to put aside for emergencies whether it be medical or household. Our savings grows little by little every month, but we don't touch that. Lisa and I don't spend money frivolously. We don't go on shopping sprees. Most of my summer wardrobe consists of pieces I purchased 5 years ago. On occasion, throughout the year, we pick up apparel for us when it's off season. On clearance. This is our saving grace. Thankfully, we're not concerned with the latest fashion trends and are quite content wearing comfortable shorts, skirts, t-shirts and shoes that have held sturdy over the years. We don't splurge on takeout too often. Maybe once or twice a month. A portion of my schedule is dedicated to making meals and snacks. Homemade. Fresh ingredients. We take advantage of grocery store sales and coupons, farmer's markets, and garden fresh produce during the summer months. Our menu depends on what is in season. On the weekends, we pretty much stay put unless we have errands to run or take the occasional few hours of kid-free time. By occasional, I mean a few times a year, usually during the summer months, when we spend the afternoon frequenting yard sales or flea markets. We do have date nights, but those are spent at home and consist of dinner and a rented movie. Like you, we clean up puke. When one of our kids aren't feeling well, we tend to them and seek medical care. Our work days and life isn't 9-5. I get about 3-4 hours of sleep a day, if that. I stay up all night to work because that's the only time it's quiet enough for me to write articles. Our kid's needs and wants come first. If there's a thunderstorm at 2 in the morning, Lisa is up because our kids, especially Sophie, are afraid. We get minimal back during tax season. We're not able to claim our 3 kids or any of the expenses. Our sacrifices and hard work and daily schedules aren't recognized by the IRS. While caring for human kids and fur-kids are worlds apart, us dog Moms can relate to the time, love, dedication, expenses, puke, poop, and everything between. You get reimbursed for a small portion. We don't. Your attitude of entitlement pisses us off. We don't have it easy. Just because we don't have human kids doesn't mean we're rich. There are no money trees growing in our backyards. We make sacrifices just like you. And, we do consider ourselves lucky, but not in the sense you've implied. We're lucky to have 3 amazing rescue kids. Our home. Jobs. Food on the table. A strong work ethic. Kind hearts. Incredible friends and family. That alone is worth worlds more than the amount of money you received in tax returns compliments of your human kids. That. Is. All. Face forward. Onward march.